In the shallow, warm, coastal waters of Egypt, Hani, the dugong, swam. He tugged at the sea grasses that grew along the bottom of the sea. He ripped them up with his chunky teeth, chewing slowly before swallowing and ripping up more. As he held some long shoots in his mouth, Hani looked up through the shallow water to the surface. He liked the way the sun's rays bent at odd angles as they filtered down under the water. It looked pretty to him. Hani noticed something floating above him. It was a glass bottom boat. He became curious and swam up towards it. As he got closer, he saw that it was filled with people, a lot of them were young children. He swam closer and closer. He came up to the surface a bit away from the boat, as dugongs have to surface to get air to breathe, because they are mammals. He also wanted to see what the glass bottom boat was all about. He bobbed up and down in the sea, making small squeaks, but the children didn't hear him. After he'd filled his lungs with fresh air, he swam back down, and came up right under the glass bottom. All the people began to scream. "Look at that ugly monster!" one little girl cried out. "Is that a sea monster, Mamma?" asked another child. Eeek! It's going to eat us!" called yet another boy. Hani, not realizing that they were talking about him, looked around to see where the monster was. He was very frightened. He'd never heard of a monster being under the sea before. The children were crying that it was ugly. He heard one child saying that the monster had spikes coming out of its face, and was scary looking. Hearing this, Hani swam away and hid behind a mossy rock at the bottom of the sea, looking all around for the sea monster. "I wonder where it is?" he asked himself. "I don't want it to eat me! Will it see me hiding here behind the rock? Please don't let it eat me! Please don't let it eat me!" After a while the boat went away and Hani, seeing no monster, slowly swam out from behind the rock. He checked very carefully and then went back to eating his sea grass. Now and then he'd turn around and look, just to make sure the sea monster wasn't lurking nearby. Hani made his way along the sea bottom, passing by some beautiful black coral. On the other side of it he spotted some movement. He backed up and hid. "Oh no. What if it's the sea monster? It will eat me! Help!" he whispered. He stuck his big round head around a piece of the coral to see if he could see anything. Much to his relief, he saw that it was only some scuba divers. They were looking at the coral and bright colored fish that were darting around. Feeling more brave, he swam back over to the sea grass and started chewing away. Still, being a curious dugong, he kept his eye on the divers. He saw them pointing at things, and watched them as they photographed the coral and the fish. He looked up when he saw one of the men pointing at a stingray swimming up near the surface. Hani smiled when he spotted an angelfish and marveled when it swam right up to the divers and ate food out of their hands. One of the divers stopped photographing and looked up. He saw Hani. Suddenly he began to scream. Quickly he swam over to the other divers and pointed at Hani. They all mouthed the word "Monster!" them swam up to the surface. Hani began to panic. They had pointed in his direction when they had said "Monster!" Did that mean the monster was behind him? He turned around quickly, but saw no monster anywhere. He was scared. He swam fast, swishing his whale-like fluked tail back and forth, moving him down to the bottom of the sea. He hid next to a rock. Then he turned, using his front flippers and hid. "Where's the monster? Where did it go? I know it's down here somewhere," he whined, turning left and right, looking for it. "Please don't let it eat me. Please don't let it eat me," he begged. While he was hiding he saw a lionfish, and a big turtle swim by. "They'd better go and hide or the monster will eat them too," Hani feared. He watched as they swam about the sea, not seeming to care that there was a sea monster nearby. Hani kept hiding for a while longer, then, seeing no monster, went back to eating his sea grass. He always kept a watch though, just in case. When he got full, he went up to the surface to get some fresh air. He surfaced near the docks. There were thousands of containers from container ships, filled with everything imaginable, stacked four or five high. There were men on the docks working. One looked over to where Hani was and saw his face sticking out of the water. He began screaming, "A sea monster! There's a sea monster in the water!" In just moments, some of the others came running over. "What is that ugly thing? It has spikes, or straws, sticking out of its face," one man said. "Look at its face. It has small eyes, and a large snout. But it sure is big and fat, and the ugliest grey-bronze color," said another man. Hani looked around him. He could see no monster. He stuck his head under the water to see if it was getting ready to eat him, but saw nothing. Hani began to wonder. "Could it be that they are talking about me?" He swam to the left and they followed him with their eyes. Then he swam to the right, and they followed him again. He stopped swimming when he saw his reflection in a container that was sitting on the dock. He realized that it was him that they were afraid of. "I have bristles sticking out of my face. I'm kind of fat, and kind of ugly," he added. "I am the sea monster!" he said sadly. He bobbed up and down in the water, listening to the men on the dock talking about him. A few minutes later, another man came along and saw Hani in the water. "Why, it's a dugong. How wonderful," he said. The other men stood still. "That's a what?" a man asked. 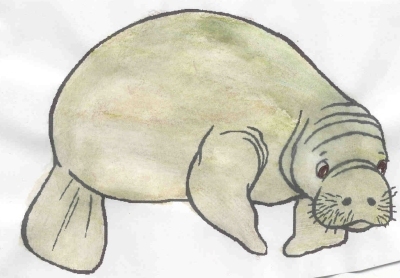 "It's a dugong, or a sea cow. They are magnificent creatures. They are also endangered, and we need to take care of them. They are very gentle, and very precious." The man went on to explain to the others how important dugongs are to the sea. Hani listened carefully. "I'm a dugong! I'm special!" Hani smiled. He felt happy. He knew that from then on that the people would think he's nice and know he's not a monster. He gulped a deep breath of sea air, and swam back down to the bottom of the sea. He started eating the sea grass from the sea grass meadows. Still, from then on, whenever he saw a glass bottom boat, or scuba divers, he left them alone!